I went for a bike ride this morning and saw this alongside Highway 2. It's as if someone disrobed and took off. 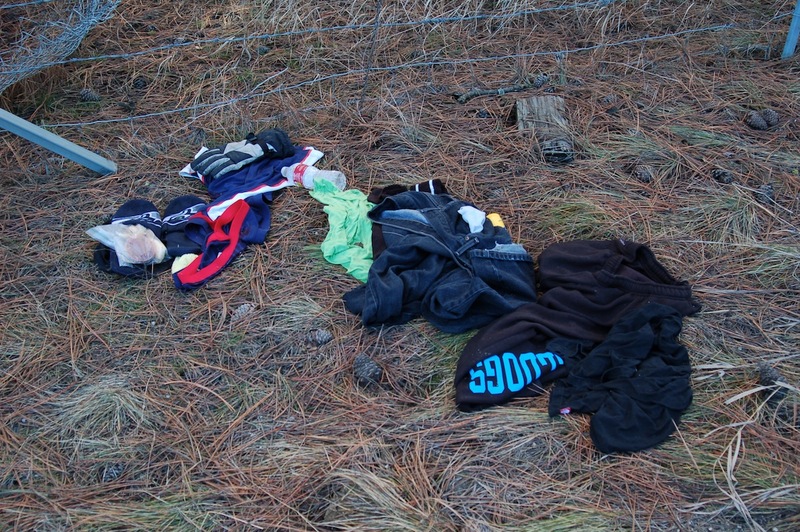 Unfortunatly more likely a stolen backpack's contents as is was rifled through. 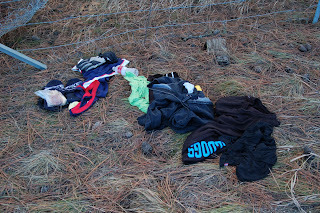 We regret your discovery of clothing items along Highway 2. We can assure you that the CIA has a firm "leave no trace" policy for drone strikes within the United States. It was never our intent for you to find personal affects of any kind related to this disappearance. The clothing was worn by two pedestrians engaged in a discussion of their comparative eschatological belief systems. This conversation occurred in a public place, without expectation of privacy, and was picked up by tiny Eavesdropper surveillance drones flying at approximately 300 feet. One of the pedestrians clearly advocated a slightly unorthodox view of heaven, of which Nancy Pelosi has expressed disapproval. Because the suspects were well within the 100 mile international border area where the Due Process Clause, 4th and 5th Amendments are suspended, Border Patrol agents were sent to discretely follow the suspects and wirelessly download the contents of their smartphones. As it turns out, one of the suspect's smartphones contained images from an "Occupy" protest against the banking industry. FBI agents from the Spokane Fusion Center immediately contacted Goldman Sachs to notify them of the potential threat, and to involve the bank in the security discussion on the disposition of the individuals. The final decision, of course, was made by a top-secret committee with no identifiable members. A Rapture drone was sent to vaporize the suspects. You will be glad to know that the drone "pilots" were awarded with extra large medals for their valor. Super shiny ones. Unfortunately, Mr. Greer, now that you have revealed this information, you, and all the readers of your blog, are next.